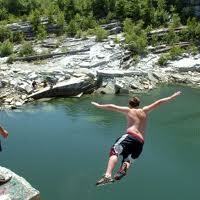 As promised, a few tips about dealing with teens who take dangerous risks. IMAGE from Bangor Daily News. Reality check; Parents do not have the control the experts want you to think you have. Not even the police can stop all risky behavior. I picked this picture becauase it reminded me of the dangerous water-filled quarry, the kids in our neighborhood all loved to swim in. It was fenced in, posted with no trespassing signs, but kids would rather swim there than their parents’ pools or at nearby Long Island Sound. Increased police sur­veillance only added to the adventure. The kids always figure out when they could swim and dive into the boulder-filled pool without being hassled by the cops. Scary, still there are a few things you can do. Tip one: Do read yesterday’s post about how it is best to start early to safety proof your kids. A number of the tips can still be implemented. Tip two: Convene a family meeting, Don’t do family meetings? No time like the present to start. And yes, here is a plug for my eBook about How to Hold a Successful Family Meeting. You are meeting to discuss safety and nothing else. You want the child to hear your concerns and take them seriously. S/he will be in charge of calming your concerns. If that is done, no further meetings will be necessary. Here are the suggested meeting rules. Each of you speaks in turn and speaks briefly. Three minutes is the suggested time for having your say, no interrupting, you listen to each other, you respect each other. Why not get on with the consequences at this meeting? You are putting the ball in your kid’s court. If you have to impose consequences, the kid has earned them. Tip three: Consequences that work with teens are not easy to come up with. Grounding only seems to work when a Good Kid wants you to pull in the reins. Other options are loss of privileges particularly allowance, cell phones, all phone privileges and finally, the right to drive. A consequence most family do not think of is a mental health evaluation and family counseling, but these needs to be on your list. Moreover, if the risk taking involves illegal activities you are an accessory if you permit such behavior. In that case the result needs to be involving a lawyer and following his or her advice. Tip four: You need to adjust the above to the seriousness of your child’s risk taking behavior. If you kid is getting hurt at the rate of requiring medical intervention monthly, or has been stopped for speeding more than once, you need outside help. Get it. Talk to your family doctor, the school social worker, your religious advisor, a lawyer, a therapist, or the local youth officer. Tip five: Get the free down load of my book When Good Kids Take Risks. It discusses these issues more thoroughly and is available until midnight June 11th. See the side bar. More kids than not survive the teen years. The few risk takers – adults and kids that don’t survive are the stuff of headlines. The fact is most risk-takers learn from lesser hurts than the ones in the headlines. This entry was posted in Parenting Issues and tagged Emotional fitness, Emotional Fitness Training, Emotional Health, Free eBook, Katherine Gordy Levine, Keeping your kids safe, Parenting advice, postaday, Risk taking in teens, Risky Behavior Tips for Parents, When Good Kids Do Bad Things. Bookmark the permalink.